In 1956, Dorian "Doc" Paskowitz stepped away from a successful medical practice and began a lifelong surfing odyssey that grew to include his wife Juliette, and their nine children. Together, the Paskowitz clan lived a vagabonding bohemian existence, eschewing material possessions in favour of intangible riches like health and good cheer . . . all the while careening along the world's coastlines in search of the perfect wave. In Scratching the Horizon, Izzy Paskowitz looks back at his unusual upbringing, and his lifelong passion for the sport that carries his family's stamp. As the fourth-oldest child in a family of inveterate surfers, rock stars, and beach bums, he is uniquely qualified to shine a light on a childhood that has come to symbolize the surfing credo, a reckless young adulthood that nearly cost him his sanity, and a maturing sense of self and purpose that allows him to lift others on the back of his experience. As the father of a son with autism and the founder of "Surfers Healing," a foundation devoted to expanding the horizons of children with autism through surfing, Paskowitz has found a way to connect the surreal aspects of his childhood to the harsh realities of adulthood, and he shares these discoveries in this wickedly entertaining and transforming memoir. IZZY PASKOWITZ has competed in, and won, dozens of longboard titles, including the 1988 Hang Ten World Championship. 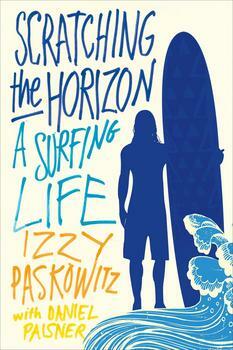 He and his wife, Danielle, own and operate the world-famous Paskowitz Surf Camp. They also run the nonprofit organization Surfers Healing, which offers free surfing day camps to hundreds of autistic children and their families each year. Paskowitz lives with his family in San Juan Capistrano, California. DANIEL PAISNER is the co-writer of eleven "New York Times "bestsellers, including Serena Williams's "On the Line" and Denzel Washington's "A Hand to Guide Me," as well as the acclaimed Holocaust memoir, "The Girl in the Green Sweater," with Krystyna Chiger - an international bestseller. He lives in Port Washington, New York, with his wife and three children. A bitchin' love letter to sand and sea, and a spirited inside account of life with the "first family" of American surfing.